"FREE" Energy Announced- Earth Immediately ENDANGERED!! Why Tom Bearden's (and similar) energy devices for extracting (cohereing) Power from the gravity vacuum are DANGEROUS. (How all humans should sensibly respond to "Bearden Announces FREE Energy"). At the "National Symposium on Non-Conventional Energy Technology in Atlanta. (George Hathaway and Ken MacNeill - mentioned below) - the title of my talk was "Why FREE ENERGY Devices Should NOT Be Called FREE". The irresponsible nature of those who continue to do so needs STRONG emphasis, if our genepool is to survive the soon impending magnetic compression of the sun ( 2004-2012 Solar Maximum / 'Rapture'). Non-destructive compression / scale-invariance (immortality) WILL NOT HAPPEN for Earth's biosphere if this ignorance continues much londer. Tunnelling .. The "Black Hole": In the Human Heart...Is Acceleration Thru Light Speed in the DNA Braid Occassioned by the Heart's Blissful Sonic Pony Tail, How Compression Thru Light Speed Becomes "Tunnelling"
Standing Wave - Root of the Root..
We agree that 'Scalar' or 'Torsional' energy is a WIND of electromagnetic CHARGE which moves BETWEEN frequencies (the perfect heterodyne or CHIRP) . Physicists in their fantastic arrogant ignorance - 'do not have a clue why any object falls to the ground'. When the wind of charge compressing by PHI recursively adds (multiplication and addition perfected by Golden Ratio) - then the wave VELOCITIES get a COHEREING SPIN PATH THRU THE SPEED OF LIGHT. The result of this WIND OF CHARGE thru the speed of light, IS EXACTLY LIKE THE SUCTION THAT HAPPENS WHEN YOU PULL YOUR BATHTUB PLUG. THIS 'WAY OUT' FOR CHARGE INERTIA (WIND) - has previously been labeled "GRAVITY". Physicists wrote HUGE mostly wasted books (Wheeler on Gravity for example) claiming they understood merely because they could quantify (or measure the RESULTS of GRAVITY) WHILE STILL NEVER HAVING A CLUE WHERE IT CAME FROM! When Phycisists use the word GRAVITY they are rather like the foolish biologists who use the word INSTINCT. The accurate technical translation of the word INSTINCT in almost every usage instance means "I DON'T KNOW AND I AM DEFINITELY AFRAID TO ADMIT I DON'T KNOW AND THEREFORE ENCOURAGE YOU TO GO IN DENIAL ABOUT THIS - LIKE ME BY BEING AFRAID TO ASK THE QUESTION AND THEREFORE USE THIS WORD AS A HIDING PLACE FOR MY SCHIZOPHRENIC FEAR TO ADMIT TOTAL IGNORANCE" . (Instinct refers to the potential to self-organize / ' make cohere and cocoon' - around the largely collective - and faster than light speed FIELD EFFECT -'collective mind' - when genes and glands electrically implode). Notice that this (gene geometry) fractal charge compression device COULD - by RECURSIVE adding and multiplying (heterodyning) of bio-wave front 'phase' VELOCITIES - then ACCELERATE YOUR BIOLOGICAL MEMORY/MAGNETICS - THRU THE SPEED OF LIGHT. (It is fatal to be caught below). We recommend learning to steer this faster than light tornado (soul) in order to DIE (compress) successfully. The Geometry of Eternality, Geometry & The Bardo.. This is a picture of the Charge Geometry of Bearden's and other "FREE ENERGY" 'scalar /torsional' little toys. When you do it ONLY MECHANICALLY - you cause the GRID to bleed. Emotionally - It feels HORRIBLE - as anyone who ever stood next to Newman's "FREE" Energy device will tell. See: The Implosion Phenomenon - MECHANICAL HAZARDS: Psychological Import of Phi Harmonic Music Phi Scalar Technology & MonoAtomic Gold..
Non-destructive continuous acceleration IS GRAVITY. (As Einstein proved). We have simply solved his unified field problem by answering his stumper question: WHAT IS THE GEOMETRY OF INFINITE COMPRESSION? It is - infinite non-destructive compression / constructive recursive wave interference optimized by self-similar recursion: the picture above of DNA's correct geometric view - is also that of the Earth Grid, the zodiac, and every alive (charge fractal attractive - and therefore 5 sided / pent) biological protein. Now you are done understanding what 2000 years of Earth Physics did not. (Like Jody Foster in 'Contact' - you can get in your compressing dodeca - and fearless without resisting spin density - jump into the dimpling wormhole that IS the braiding genes in your BLOOD ... and make REAL 'Contact'). Otherwise - you die - permanently - like those ignorant "FREE Energy" scientists who persist to write laws which don't embed in natural law. These are like the genetic engineers who think they know how to steer the intent in biological magnetics who don't even acknowledge the FIELD EFFECT COHERENCE of DNA is your children's ONLY HOPE of IMMORTALITY. and establishes it, and how to apply the resulting principles." but then PROVES that he really DOES NOT HAVE A CLUE where this energy comes from -BECAUSE HE STILL CALLS IT FREE ENERGY. He accurately describes the necessary electrical symmetry as ITERATION BECOMING RECUSIVE. But then by failing to UNDERSTAND and failing to STATE CLEARLY - that the geometry of that ITERATION BECOMING RECURSIVE is the SELF-SIMILARITY optimized by Golden Mean Ratio (FRACTALITY). A, and hence comprising a separate source of energy that will react with a coil. Bill Ramsey (working with Hodowanec also the 'Pod Mod' and others ) once commented to me: IT IS AMAZING HOW LONG IT TAKES THESE SO CALLED "FREE" ENERGY INVENTORS TO RECOGNIZE AND STATE THAT IN FACT THEIR INVENTIONS ALL DEPEND ON AN ELECTRICAL GEOMETRY BASED ON GOLDEN RATIO. This was finally acknowledged by the builders of Pod Mod. James Patterson's crew with the Palladium Beads and water never realized the principle, because they had not a clue that the dodeca nuclear geometry of Palladium was dodeca interdigitation (valence electron and nuclear symmetries). 2. STOP calling the energy FREE - because it in fact bleeds the gravity field from which it is extracted. (The local gravity will become measureably weaker when done in large scale). This is precisely the problem which sank Atlantis (Touai or 'fire crystal' technology). The gravity field exists because nature took millions of years to arrange the Earth's long magnetic lines into the 3D fractal we call the dodeca-grid. Then nature uses genepool based magnetic collective glandular emotion to steer and con-center that fractality (sustain that implosive wind of charge) - making human evolution potentially the seed for the new gravity making systems necessary to sustain star ('angel') births. "Leading Mother Nature's Silver Seed to a New Home in the Sun"
This natural metabolism (coherent emotion feeding the Sun, unconsious emotion feeding the parasite moon / why "Tuthankhamon Prophecies" requires the EMBEDDING in time fractal which is a SOLAR calendar ) is a local natural microcosm of the galactic forces by which biological intelligence becomes the regulating force permitting Star Sytems to be self-aware / self organizing and thus experience/ FEEL Gravity relations (erotically ). / FEELING is biology steering magnetism. WHOSE CHARGE RECURSION IS PRECISELY WHAT ENABLES THEM TO FEEL BLISS / EUPHORIA. (Self-generate an immune system). BrainPhire?Fractal Golden Ratio Harmonics in BrainWaves as Mechanism of Euphoria / Active Visualization / Bliss? The very soon fatal loss of life force / loss of charge embedding in cities planned without regard to the need to attract and self-organize charge is evidence. Life force consists of the ability to attract and self-organize charge. Measuring Life Force - & Making Love Visible? People walk down magnetically dizzy and un-embedded concrete canyons in literal schizophrenic electromagnetic SHOCK because their bodies have been electrically insulated from true fractal ground for so long. The tragedy is that when you look into their dying eyes, they truely still have no clue what is KILLING them. If they would merely relocate to proper vision quest environs (wood/stone place in woods - no man made unembedding magnetics with live foods) they would recover charge (life). Otherwise they are like deer on an island who ALL die because they fail to recognize the source of what kills each (overpopulation depletes capacitance). 4. The decay of the self-organization / implosion of the genes (evolution of consciousness.). - WHICH REQUIRE A GRAVITATIONALLY FRACTAL ENVIRONMENT TO MAKE BLISS / IMPLOSION MAGNETICALLY SUSTAINABLE. The group bliss experiences necessary to ensoul genepool soul-groups to pod making, and star navigating gravity surfing cocoons are prevented. Gravity like wind is not-homogenous or evenly distributed, like any oscillator it either needs to become recusive / embedded and therefore a SELF-AWARE ('blood'stream) or IT WILL self-destruct. (Embed or Die). Those who choose to ignore this (Bearden's poor wanderers in the wilderness) unfortuneately do so not only at their own peril, but that of all Earth little quarantined genepool. MEG built by NaudinWe are announcing an event of historical nature. It occurred on March 26, 2002 - a day that will probably go down in history as being equally important to the quality of life on Planet Earth as that faraway, unknown moment when our ancestors discovered how to make fire. In the beginning, heat and light were free to mankind, and now they will be again. Unlimited free energy! As we reported earlier, we felt that if plans for water-fueled automobile engines were allowed to be released, as our February issue proves that they have been, this would be an indication that free energy devices also would finally be allowed. We didn't realize that it would come this quickly, but it is here now. There is a cloud over this event, however. Dan Winter, a well-known theorist of zero point energy and related phenomena, feels it necessary to warn the world that this particular way of accessing the zero point energy could be dangerous to life on the earth. He is asking for more research, for the planet has never experimented with this basic energy on a large scale. There have been only small, isolated cases. He wants to know what will happen when this invention spans the globe. We feel that this is prudent and wise, for the truth is that no one knows very much about this new energy. But everything, and everyone's ideas - including Dan Winter's - are simply theory until we actually see what happens in nature. When we first discovered x-rays, we were sticking our body parts under the machines for long periods until we realized they could give us cancer. But the MEG is no theory. This patent constitutes absolute proof that zero point energy is real. We don't have to ask if it works any more. We now have a working model to prove it. Only a few days ago, the United States patent office granted US Patent #6,362,718 to the four inventors: Stephen L. Patrick, Thomas E. Bearden, James C. Hayes, and Kenneth D. Moore. The MEG (Motionless Electromagnetic Generator), with no moving parts, will give a steady flow of 2.5 Kilowatts forever without the input of any fuel whatsoever. The science under which the MEG operates is being called Longitudinal Scalar Electromagnetics. What do we have to hope for? Assuming that it is healthy for life, which must be determined, the MEG will be a good beginning. Next year, in 2003, the MEG will go into production, meaning you will be able to actually buy one and take your home "off the grid" - which is the very theme of this month's Spirit of Ma'at. The MEG also means that electrical cars will become a reality, because they will never ever run out of electricity. After the initial shock on the market, it can also mean no more oil cartels plunging us into wars, running our governments and our lives. The US can finally, once and for all, be free of foreign oil. Is this not the direction our President has been asking for? George W. Bush has a bill before Congress to help fund alternative fuels in automobiles. Though it was originally aimed at making it easy for people to install fuel cells, running cars with the MEG would qualify under the new bill, and would solve so many of our energy problems. At the present level of this new technology, it's going to take about eight (2.5 kilowatts each) of these MEG devices connected in series to run your house. A more powerful model on the drawing boards will enable you to run your house with just two 10-kilowatt units. March 26, 2002. Remember this day, for free energy is now becoming a reality on Earth. At least, it definitely appears that way. Even if this particular invention is condemned, it proves the theory that free energy is possible. All the old restrictions of physics are forever changed. Even if the MEG turns out not to be the best solution to our energy needs, we here at the Spirit of Ma'at feel that it will not be long before the human community, with the veil of ignorance lifted, finds a healthy pathway to energy freedom. The upside: At rense.com you will find an article on this by Bill Morgan, who also has compiled a formidable set of Tom Bearden's writings on free energy and made it available at Bearden for Beginners. the form of a symmetry grid, to metabolize starlight directly. on the membrane of an atom. with Acknowledgement and Thanks to Ron Ginsberg..
regenerating grand ground state of the universe." definition and measure for mass, and hence for the term: "particle". imbalance in the flow between fields. Brother Rabbit might have said... sure but isn't everything? interference in a rotating wave field.. nothing else survives). can occur in the harmonic series. The key words here being: harmonic series. Let's look at a typical vanilla type atom: Electron shell made up of platonic like symmetry fields. The Nucleus is made of the SAME kind of platonic symmetry fields: the scale changed, the RATIO DID NOT. The phenomena obscurely labeled mass and gravity is created by the symmetry of the electron in RELATIONSHIP to the same symmetry in the nucleus. In each case an array creates a ringing field. The cascade (of frequencies or wavelengths) between the field of the electron and the field of the nucleus... is a fractal kind of attractor, and we call that gravity. GRAVITY IS A RECURSIVE OR SELF EMBEDDABLE FREQUENCY CASCADE, created by field symmetry. This is just a new slant on an old language. How does this better enable us to tap the Zero Point Energy? Zero point energy got its name because the energy there was tapped as resonance coupling reached a limit at high frequency short wavelength, hence literally a zero point. Visually as all fields can appropriately be modelled hydrodynamically, this point is the the apex of a cone or vortex. PHI OR FRACTAL OR SELF REFERRENTIAL SYMMETRIES PERMIT THIS CONTIGUOUS SPIN PATH TO ZERO POINT. based the braiding symmetry of recursion. grey scaled dodeca... the resonance reaches another dimension. of that fractal flowform back into the flux from which it came. realize how exactly this Phi ratio is related to Lo-Phi.. Love..
biology's symbiosis with a planet's gravity field. Why do human feelings get metaphors like heavy and light?? embeddedness in it before we mess with our nest.. This note is to summarize my position on alternative energy technologies, particularly those which are often labeled zero point, or free-energy, or gravity energy, or scalar devices. I want to be clear that a lifetime of technical experience convinces me such technogy is viable and real. I have known of dozens of forms of such capabilities in many stages of development. I constructed a non-linear faraday disk principle generator with Tom Valone, former president of Psychotronics National. Tom is PhD.Physics, Univ Bflo, and Licensed Prof Engineer. We visited Tim Wilhelm's DePalma type Non-Linear Faraday Disk generator installation at the Stelle Institute in Illinois. I have spoken at dozens of national conferences on this subject. Tim joined me during the lecture I gave at the National Symposium on Non-Conventional Energy Technology in Atlanta. I have known for years, and maintained communication with the sponsors of that conference (George Hathaway and Ken MacNeill). As Service Manager and troubleshooter in a busy EASA recognized motor and generator repair firm, naturally I am quite involved on a daily basis with the evolution of generator technology. All this, is by way of saying, I may be in a position to make a comment about the next evolutionary stage of electrical energy. We recently sponsored a meeting between representatives of Xerox photoreceptive crystal research, and the local piezoelectric tech firm PCB Piezotronics, and techical rep fromUB's laser lab. This was based on our developing understanding that the non-linear frequency cascade inherent to the folded field assembled in all these class of devices, could be done most elegantly/efficiently in solid state. These conversations are very much ongoing. In order to facilitate communication among those who are involved in related projects, I make daily updates in our multiply indexed contact file. However the number of folks who appear to be poised to make cutting edge contributions is small. 1. What is it about the folded field of the classic cadduceus (alternate over/under) coil winding which solved Einstein's criteria that the magnetic monopole was the key to gravity? Hint :Implosion..
2. Why did or could Tesla's power transmission without wires cause Earthquakes? He attempted to ring the planet. How do broad sprectal electromagnetic stresses affect the coupling of the tectonics to the Earth's liquid core? 3. What frequency signature allows the fractal heterodyne resonance cascade called gravity and why? 4. Why do Earth grid time and place spacing limit nuclear device critical point? 5. Why is gravity or zero-point energy not free, and how has biology directly and symbiotically helped to create the coherence of Earth's gravity bubble? 6. Why was the Tuoai Stone energy device called the "fire" crystal when it was designed not to emit heat? What is the shape which could optimize fusion containment? These are the kinds of issues which are prerequisite to using the next generation of electrical energy sources responsibly. Note, I do not think answers to these questions are required to produce energy in a new way... only in order to UNDERSTAND how to use it. I began speaking at Non-Conventional Energy Source Symposia over 10 years ago. My work at that time with the John Moray device ("Sea of Energy" book), and the Tuoai Stone "Atlantean Fire Crystal" piezoelectric cascade, and others had shown me that what were being called "Free Energy" devices were definitely misnamed. And that in fact it was critical for our use of them that we not call the energy free. This is because what limits devices which couple the gravitational field for electrical energy, is the coherence and stability of the gravitational field bubble itself. This field is clearly a bloodstream which has been accreted with a sophisticated symbiosis between higher biological forms (cf emotion and the grid), and the flux lines between planets. Gravity itself is measureable as a harmonic series cascade; its non-homogenous density means it stores symmetry into mindfulness exactly as the foldedness we call brain does. Certainly your viewers are not going to grok the metabolic dynamics of a living gravity field immediately. However, they will slowly come to realize that the yearning for access to a weaned off fossil energy, metabolizing starlight (gravity) directly, source of fire (energy) for Earth... absolutely requires responsibility to that bloodstream. I have been blessed with years of personal involvement with Bucky Fuller, Marcel Vogel, Ben Bentov, Adam Trombley, Moray King, Tom Valone, George Hathaway and many others. THERE are several areas where we may serve each other. 1. It is critical that the leverage of media be used to seek out and neutralize the repeated and consistent "men in grey coats" harassment which has struck EVERY major inventor of a device which would eliminate fossil fuels. You should discuss the harassment which Hyde and which Paul Brown experienced with Tom Valone (Former Pres. National Psychotronics, PhD Physics, Prof. Engineer) Tom has tech specs on both devices, he worked with Paul Brown. Moray King, a research scientist with Eyring Inst. Provo,UT, spoke at our national conference on the Hyde device, will share patents..
We must gradually present the real data to the public which will enable us to realize what the "Zero-Point" energy is. It is the coherence bubble of the bloodstream of galaxies. To call it "Scalar" or "Free" energy is not enough. Recognizing the geometry of frequency signature in flux fields, is the only real universal language. ref. 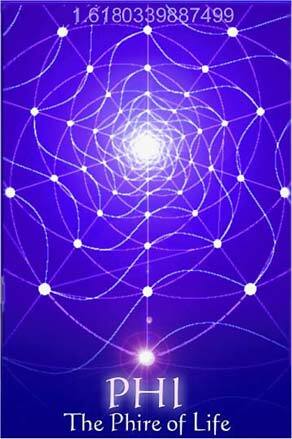 Symmetry Field Cascade: Key to Zero Point Energy, 4th article in my enclosed book. I will help prepare the necessary computer animations to teach the relationship between a healthy Earth"grid", and new energy devices, for your show. If we do our homework, we can get media to be the real voice of our collective spirit.